Ha ha ha ha! Was I wrong! I realized in the teaching profession by the time you become proficient it’s time to retire. There is so much to learn! I did NOT know how to check for understanding and, more importantly, WHEN to check. That mistake was costing me tons of instructional time. Checking for understanding is the, “I do; they help,” and, “They do; I help” part of the lesson. I know many teachers go from, “I do; they watch” to, “We do” but, often, that is too fast a transition. That extra step is necessary for students to assimilate the language. For example in the following PowerPoint on Gustar, students take baby steps; first they help me complete the sentences, then they write their own and I walk around and help them. As you can see in the template, the time to check for understanding is immediately after you have taught the concept, vocabulary, story. That way you will know if it is time for students to practice or or if you need to reteach. And since we are teaching in small chunks, we check for understanding after every little chunk. So, what are some strategies for making a quick assessment? Checking for understanding is not usually in the form of a quiz. It’s a scan-the-room assessment the teacher can make in a few seconds. Did they get it? How do I know they got it? What strategies do YOU use to check for understanding? I would love to add them to my repertoire. 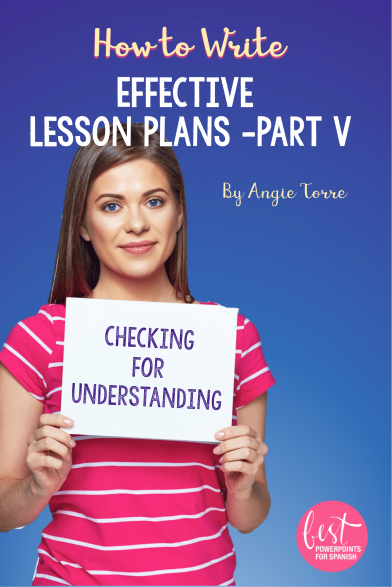 See how easy it is to write an effective lesson plan? Just make sure you don’t do what I did and put the check for understanding at the end of the lesson. Save that precious instructional time! Happy teaching! In our next blog post we’ll be talking about how to incorporate guided practice activities into the lesson. Stay tuned!